A resource for the professional designer and pavement/retaining wall specifier. Cambridge custom colors - Madison Blend, Bluestone Blend & Madison Red installed in excess of 100,000 sq. 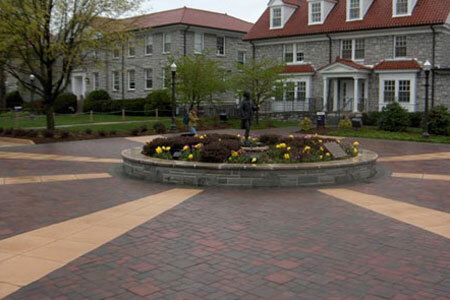 ft. - passed with high marks at James Madison University in Harrisonburg, Virginia (See photo right). For reasons like this, Cambridge Pavingstones continues to be the brand of choice by respected engineers, architects, landscape architects, developers, municipal leaders and other pavement and wall specifiers. Cambridge Pavingstones with ArmorTec and Wall Systems offer quality and value with outstanding sales and technical support for a host of commercial, industrial, retail, municipal, institutional, and other applications. Numerous municipalities including Trenton; Newark; the shore communities of Point Pleasant, Bradley Beach and Avon By The Sea; New York City; Brooklyn; Annapolis; Washington, DC; Boston; Hartford; Rochester; Raleigh; Miami; Sarasota; Baltimore; Pittsburgh; Denver; Los Angeles; Kansas City; and Kingston, Bermuda. See more Cambridge Pavingstones and Wall Systems applications in our Design Gallery. The content in our Web site is intended to be a useful resource for design professionals and all pavement specifiers. Your comments and suggestions are welcome. For more information contact your Cambridge Sales Specialist or nearest Authorized Cambridge Distributor.